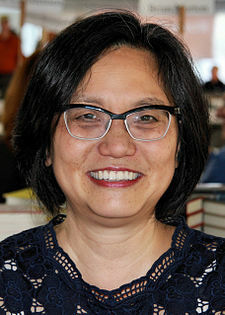 Linda Sue Park at the 2014 Texas Book Festival. Linda Sue Park (born March 25, 1960) is an American with Korean descent author who loves literature. Park published her first novel, Seesaw Girl, in 1999. She has written six children's novels and five picture books. Park's work achieved prominence when she received the prestigious 2002 Newbery Medal for her novel A Single Shard. She has written the ninth book in the 39 Clues series, Storm Warning, published on May 25, 2010. Park was born on March 25, 1960 in Urbana, Illinois and was raised outside Chicago. Linda Sue Park's parents immigrated to the United States in the 1950s, for their education. Park has been writing poetry and stories since the age of four. Park published her first poem when she was nine years old for Trailblazer magazine. Through elementary and high school, she continued to publish poems in magazines for children and young people. She published her very first book in 1999, Seesaw Girl. Park competed on the gymnastics team at Stanford University and graduated with a high degree in English. She also obtained advanced degrees in literature from Trinity College in Ireland and also from the University of London. Before writing her first book, Park worked at many jobs, including public relations for a major oil firm, food journalism for British magazines and newspapers, and teaching English as a second language to college students. Park lives with her family in Rochester, New York. Park is best known for her historical fiction. With the exception of three picture books and two novels, all of Park's books center upon Korean history and Korean culture. Her first three novels are set in ancient or medieval Korea. However, her fourth novel, When My Name Was Keoko, is about the more recent history of the Japanese occupation of Korea during World War II. Project Mulberry occurs in a contemporary setting outside Chicago. Park's book, Archer’s Quest, introduces a historical figure into modern times. Park shares her passion for baseball in her book, Keeping Score. Park's book, A Long Walk to Water, features family friend Salva Dut and his childhood experience growing up in the Sudan as well as another character, Nya who spends her entire day gathering and transporting water to her family. Park researched her Korean heritage for her books, demonstrated by historical details within the story along with sections for author's notes and bibliographies. Her topics feature characteristic elements of Korean culture, including: embroidery (Seesaw Girl); kite fighting (The Kite Fighters); celadon pottery (A Single Shard); silkworms (Project Mulberry); Korean food (Bee-Bim Bop); and archery (Archer’s Quest). She also continues to publish poetry. "An Interview with Linda Sue Park"
"Linda Sue Park Q & A"
"Author Update: Linda Sue Park"
^ "Bio: Linda Sue Park". Archived from the original on 2006-12-16. Retrieved 2007-01-01. This page was last edited on 16 March 2019, at 08:40 (UTC).